This is another Extra Detail Magnification ("EDM") obtained from two days' ago wonderful Contextual Image (or "CTX Frame", for short) of the Dwarf Planet 1-Ceres, taken by the NASA - Dawn Spacecraft on March, 20th, 2016, that showed us the - so far - "enigmatic" Mountain named Ahuna Mons. The rugged Plateau of this Surface Feature is just sparsely cratered, thus inferring that the Mountain was formed in a - relatively - recent past. The Terrain surrounding Ahuna Mons is densely packed with small Unnamed Impact Craters, reflecting the greater age of these Plains with respect to the Mountain. The formation process of Ahuna Mons is still unknown, but a joint combination of Volcanism (more Volcanism, we humbly believe, as IPF) and Tectonism appears to be quite believable. If you pay specific attention to the Summit of Ahuna Mons, you may be able to notice that its texture and color are slightly different as to the texture and color of its Slopes, as well as of the surrounding Terrain. One possibility, if Ahuna Mons was, in fact, an ancient Volcano, is that its Summit - for reasons obviously unknown - collapsed on itself, thus "erasing" - litterally - the Caldera. The White Striations visible here on its Eastern Slopes, as well as the (relatively) deep Channels located on its Northern Slopes, at the time, cannot be fully explained. However, in the future, maybe using some other picture - we hope taken from a closer distance -, we might be able to speculate a little more about this really unusual Relief. Ahuna Mons - which was so named after the traditional post-harvest festival of the Sumi tribe of Nagaland, India -, is about 4 miles (such as approx. 6,437 Km) tall, and roughly 12 miles (such as about 19,312 Km) wide. 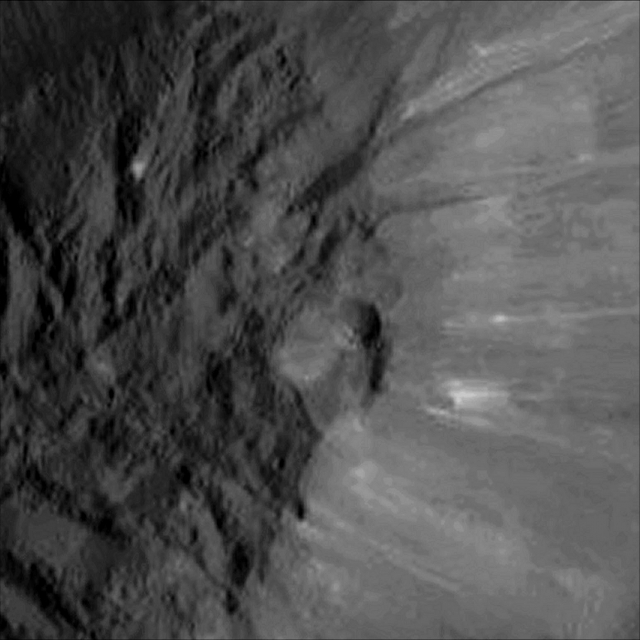 This image (which is a crop obtained from an Original NASA - Dawn Spacecraft's b/w and NON Map-Projected frame published on the NASA - Planetary Photojournal with the ID n. PIA 20579 - DAWN LAMO Image n. 84) has been additionally processed, extra-magnified to aid the visibility of the details, contrast enhanced and sharpened, Gamma corrected and then colorized (according to an educated guess carried out by Dr Paolo C. Fienga-LXTT-IPF) in Absolute Natural Colors (such as the colors that a normal human eye would actually perceive if someone were onboard the NASA - Dawn Spacecraft and then looked ahead, towards the Surface of 1-Ceres), by using an original technique created - and, in time, dramatically improved - by the Lunar Explorer Italia Team.